Bold Class Fast Attack Craft. HMS Bold Pioneer and HMS Bold Pathfinder can now be viewed as two experimental craft that did not come up to expectations. Commissioned into the RN in the early 1950's, for the further testing of the viability of using Gas Turbines as main machinery, an earlier decision to use the 1940's ex-Steam Gun Boat-HMS Grey Goose as a test bed had proved to be a resounding success. That craft, having had her steam plant removed, had been fitted with two Rolls Royce RM 60 Gas Turbines. High hopes then were held as, designed to be powered by Gas Turbines from the outset, HMS Bold Pioneer (P5071) slid down the slips of Messrs J. Samuel White's yard at Cowes I.O.W. in August 1951. Designed by the Director of Naval Construction at Bath, she had a LOA of 121ft, a Beam of 25ft-6ins with a Draught of 6ft-10ins. HMS Bold Pathfinder however, similarly planned by the D of N C, was designed as a 'Round Bilge' vessel and she followed down the slips at Messrs Vosper's yard at Portchester on September 17th 1951. Her LOA differed slightly at 122ft-8ins and her Beam at 20ft-5ins. The Main machinery of both vessels was 2 x Metro-Vick G2 Turbines, supplemented originally by 2 x Mercedes Diesel engines for cruising at 16 knots, driving 4 shafts. (The Mercedes engines later being changed for Napier Deltic's). 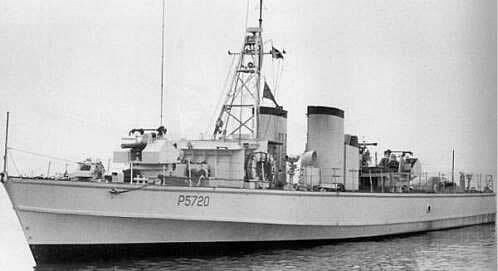 As Gun Boats they had 2 single mounts of 4.5ins (fore and aft) and a 40mm Bofors aft. (On HMS Bold Pioneer, tests were made with a new 3.3inch gun but this gun proved to be a failure). As Torpedo Boats, they had a 40mm Bofors on the forward mount with 4 x 21in Tubes. Any 'failure' must surely be partly redressed by the valuable experience gained and passed on for development of the completely successful design of the 'Brave' class of Fast Attack Craft. HMS Bold Pioneer. Was launched August 18th 1951, scrapped in 1958. HMS Bold Pathfinder. Was launched September 17th 1951 was sold to Messrs Pounds of Portsmouth for scrapping in 1962, (reportedly not completed until 1986).